I don't personally consider myself a knitwear designer, but I do have designs ideas of things I want for myself or for my kids. This sweater/tee was a result of wanting a simple piece for my daughter's wardrobe that would transition from season to season, and be could worn as she girl grows. I made the first one for my daughter when she was about 6 months old, and it was immediately one of my favorite things to put her in. I could put it with jeans, over dresses, with skirts and under/over jumpsuits. It was warm but soft. It cleaned up well, and stayed pill free and like-new after dozens of wearings. I made it over and over again, perfecting the proportions and making different sizes. I'm really happy with the result, and I hope you will find it as useful in a girl's wardrobe as I do! I just finished a third version for her and I know I'll make it many times over. The yarn I used is O-wool balance, which is a 50/50 cotton merino wool blend. It has a range of beautiful tweedy colors, and is a yarn I've used over and over for children's knits. It withstands a lot of wear, but it is soft without having to be overly processed like superwash yarn. It can be machine washed on cold/delicate cycle. This design only takes 2-3 skeins, and with each skein $7.25, it's also a very affordable project! It's seamless, with the shoulders grafted together. If you haven't tried grafting/kitchener stitch before, it seems intimidating but it's very simple and I find it easier than seaming! My talented cousin and photographer Lesley captured these beautiful images of her stunning daughters modeling the tee and I love that it is a design that looks just as modern on older girls as it does toddlers and babies. Kate (age 2) is wearing size 2, and Ella (age 8) is wearing size 6. 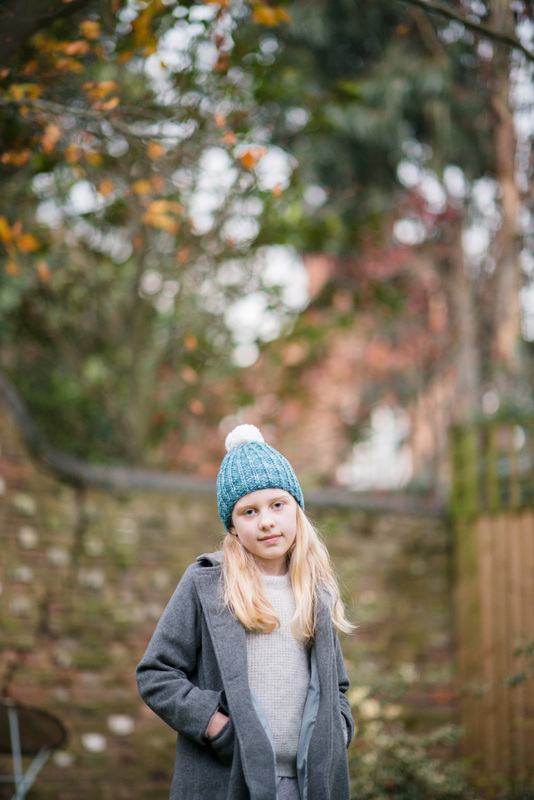 Ella's measurements corresponded to the size 6 and it fits her beautifully. You can also easily add length for long torsos or other customization for fit. The pattern is sized from 6 months to 8 years old. Available very soon! I love the texture that slipped stitches give. They highlight yarn's texture and loftiness with larger pronounced lines that stand out from the purl bumps surrounding them. I had some single spun Malabrigo Mecha in my stash that was just begging to be a hat. Named Marlow after my Grandpa, it is a great cozy unisex hat for all ages. While Mecha is classified officially as a bulky weight yarn, it actually is a bit thinner than other bulky weight yarns and to me is more akin to an aran weight yarn. Because it is a single-ply strand, it has more loft than other tightly twisted aran yarns. I have made this hat using Malabrigo Worsted and Madelinetosh Tosh Merino Light held double to create a subtle marl with beautiful results. In this case it is important to work a gauge swatch to double check that your sizing will be accurate. Using larger needles, this hat knits up lightening quick, I can usually finish one in 1-2 days, and it's just a one skein project. Because the pattern contains sizes infant to adult, everyone is covered in your family or for holiday gifts. It can be be made longer to wear slouchy, or choose to put on pom pom on it (or not), it can be made to your preference. I've made this hat dozens and dozens of times so far, and I have yet to tire of it! Different enough to be interesting, yet mindless enough for movie watching. My favorite kind of project. Thanks to my talent cousin Lesley Colvin for the photographs, her children are so beautiful and served as wonderful models. Dear friend Amanda Jane Jones did the graphic design for the pattern, her work is always gorgeous. Get the pattern here and happy knitting! I love making things for other people, the problem is I really want to be sure that they will actually use it. In the past I picked out a different hat pattern and yarn choice to fit each person's style, but now with limited time I can't devote myself to 15+ bespoke gifts. Last Christmas I really wanted to make handmade gifts for my family, but with a new baby I needed something quick but also useful. I looked into getting thick industrial felt, but the cost was too prohibitive for what I wanted to do. After a few trials I came up with these simple trivets. To me they seemed almost too simple, but my family loved them. They were all so confused on how I had made them, the technique of felting is a pretty magical trick. The lamb's pride bulky knit up really quick, and I felted them in batches. The contrasting heathers created a multidimensional texture when felted, which helped them feel less "homemade." I picked charcoal, light gray, and blue heathers and created color-blocked versions, but I love them plain or embroidered as well. I ended up making about 15 in about a week and a half. To cut the cost even further, I was able to pick up all my yarn through destash on ravelry, and found the colors I wanted through people selling what they didn't want anymore, at about 50% off. Other colors that I used: M03 grey heather, M04 charcoal heather, and M82 blue flannel. I think Álafosslopi yarn would also be a great choice as a substitute, and using the Plötulopi to embroider the felted product. I plan on using these for my next batch. It would be a great base for a wooly tattoo, the possibilities are endless.